Starting your own business is scary and involves lots and lots of hard work.. When you first get started, all you have is your idea and your determination to succeed. You must create everything else along the way. It’s not that the naysayers are not smart or that they want you to fail, it’s just that they don’t have all the information. They don’t always see your vision and they don’t understand your determination. Therefore, while it’s useful and necessary to talk to people about your business, you must always keep in mind that only you know what you’re capable of. Introducing Brittany and Ryan …. What did you do before you started your own business? How did you feel about that work, and what prompted you to leave it to launch a new venture? In March 2012, we had just gotten married, and I moved up to Ohio, which is where Ryan was a full-time youth pastor. In June 2012, we decided we wanted to move back to Georgia to be closer to family. October 2012 is when we made the move. We liked being youth pastors. We thought we would do something similar after moving to Georgia, but we quickly found that there wasn’t much available. We began applying for jobs online. Three hundred applications later, we got extremely discouraged. During this time, Ryan had a small “business beard” that was always itchy, so he began to play around with making his own beard oil to ease the itch. He thought it would be a good “side gig” to sell the beard oil he made until we found “real” jobs. So, our products were really born out of necessity. Little did we know that this little side gig would turn into our full-time job. 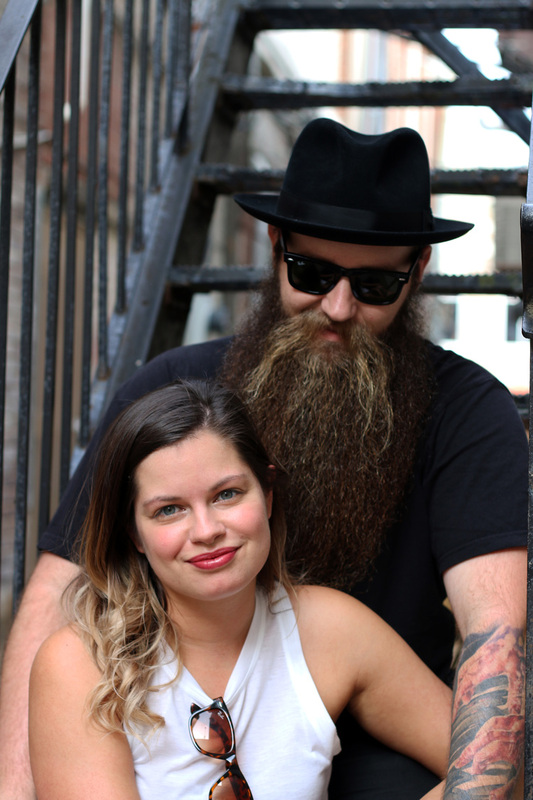 One month after moving back to Georgia, we had Dream Beard on Etsy. Three months after that, we had sold it in over thirty countries. You were discouraged by some from taking the leap, right? What were some of the discouraging comments? Which comments were most difficult to hear and why? A lot of our family members were skeptical because at the time, no one had really heard of beard oil. It wasn’t a product that people were familiar with at all. In fact, we were one of the first, if not THE first, companies to build a company solely selling beard oil. Ryan’s mom actually thought Dream Beard was part of a pyramid business model, and we were just selling it for another company! She thought that for the first year! That wasn’t discouraging; it was just funny! Hearing people mention that it was time to look for “real” jobs was difficult to hear because it seemed to quench the fire we had. It made Dream Beard seem like a lemonade stand that couldn’t be much else. It made it feel like our dreams of freedom were about to diminish. It made us feel stupid for even thinking Dream Beard could be much else. How did you overcome those naysayers? What was your process for getting past the discouragement and moving forward with your idea? We just kept going. Luckily, Brittany’s dad was gracious enough to let us stay there while we got Dream Beard off the ground. I’m not sure we could have done it without him. We were constantly hearing positive feedback from our customers. They told us how much they loved our scents and how our product really did help with itch. They explained how they looked forward to waking up in the morning just to use Dream Beard! It was comments like that that helped us block out the skeptics. What was the time frame and what did the transition look like? In October 2012, we quit our jobs and moved back to Georgia. In November 2012, we had Dream Beard on Etsy. By March 2013, we had sold in over 30 countries and we had made more than what we made in a year as youth pastors. It was all very hard to believe. Luckily it happened so quickly because we were down to our last $46 when we started Dream Beard. It was difficult to put our last few dollars towards something that had a very high likelihood of flopping. How do you feel about your decision now? We honestly have mixed feelings about our decision to start our own business. On one hand, it’s given us the freedom to do what we want, create our own schedules, and meet incredible people all over the world. On the other hand, owning your own business comes with many other stresses that aren’t there when you work for someone else. When you work for someone else, they have to worry about bringing in continual business and paying the bills. I think in the end, we would still make the decision to start Dream Beard, but we would have made wiser decisions if we knew then what we know now. What advice would you give to people who want to venture out on their own and follow their dreams but are being discouraged from doing so? It’s better to try than to wonder and not know. It will always be hard to find cheerleaders until you find success. You have to be your own cheerleader. If you’re truly passionate about what you’re wanting to go after, then it will supersede anything else. Things will get difficult. Things will get tiring. But keep going because there is a light at the end of the tunnel!